Waterhog Grand Premier Two-End Entry Mats are an excellent choice for scraping dirt and debris and removing moisture from shoes while still adding high style. • Waterhog Grand Premier Mat's raised-oval / raised-diamond pattern construction is superb at removing dirt and absorbing moisture. 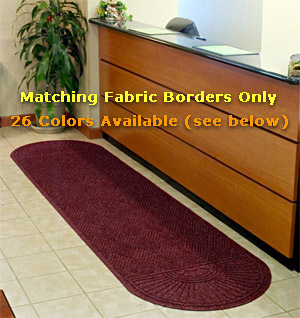 • This Waterhog Mat's surface is an anti-static polypropylene fabric can dry quickly and will not fade or rot. Thus these Waterhogs can be placed both indoors and outside. • Clean any Waterhog Grand Premier Door Mat with vacuuming, extraction cleaning methods, or hosing off and hanging to dry.